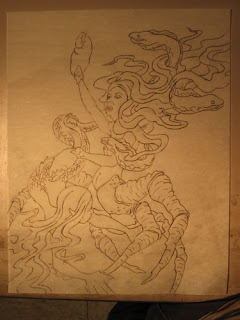 This is the drawing of my piece, executed on tracing paper and ready for transfer to the canvas. Normally I would have covered the canvas with brown paper and drawn this full size, and then covered the reverse of the drawing in graphite. The entire drawing is then heavily traced while taped into place, which transfers it to the canvas. This is laborious and time-consuming though, and now that I'm in the possession of an overhead projector it seemed like the time to try a simpler approach. 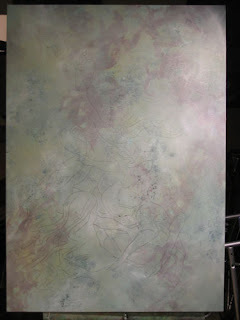 The drawing after transfer to the canvas, it isn't too visible in this photo but it's there. This version of the background is after a few more layers of paint from the previous post. Once I really got going though I stopped paying attention to how long I was spending on each step. And who knows how much time was spent on the drawing itself. Also, I'd like to thank Tori for agreeing to be my model for this, especially after all the contortions I put her through to get just the right pose.